— As above, so below. I keep coming across this line in books and even in the occasional pop song. The passage frequently pops up in occult and new age writing. It is a dictum taken from a longer passage of the Emerald Tablet attributed to the Egyptian sage Hermes Trismegistus. 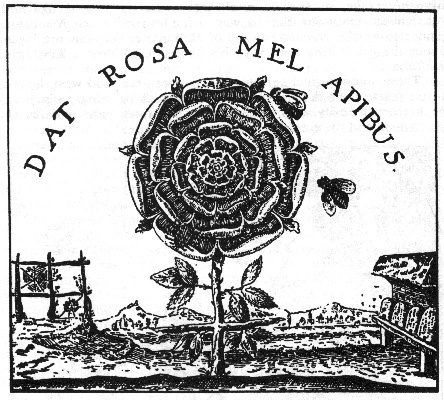 The Emerald Tablet was a crucial text used by medieval alchemists and Hermetic orders/secret societies such as the Rosicrucians. As above, so below: The concept is elegant and simple. We are each an expression of the universe and the universe is an expression of each one of us. In order to understand the microcosm one has to understand the macrocosm, and vice versa. What happens on one level influences every other level. 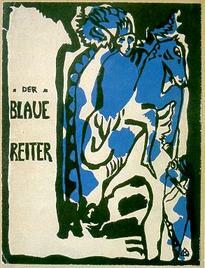 Der Blaue Reiter, a group of painters working in early twentieth century Germany approached art making as a spiritual vehicle. One of the founding members, Wassily Kandinsky sought to unite the microcosm and macrocosm through ritual, i.e., art. Together with other members of Der Blaue Reiter, Kandinsky embraced the notion of synaesthesia: the condition where senses blend such as hearing a painting or seeing music. Kandinsky was so moved by his own synaesthetic experience during a performance of Richard Wagner’s opera Lohengrin that he cites it as one of the main motives behind becoming an artist. 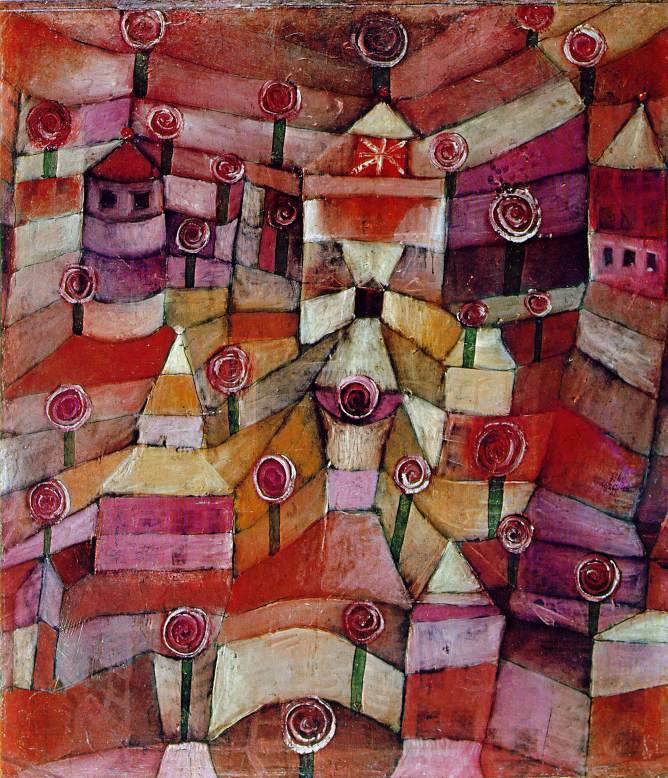 Paul Klee painted ‘fugues’ and ‘polyphonic paintings’ which he viewed as visual expressions of musical spaces through time (tempo). I’ve always been fascinated by total environments, which are capable of transporting you to non-ordinary, heightened, and synaesthetic states. Churches and nightclubs are both spaces charged via multi-sensory media; smoke-filtered colored light; incense/perfume; music; and costume. 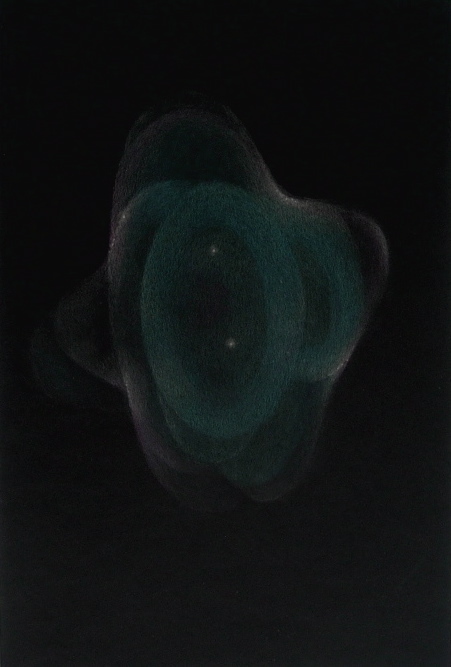 Perhaps making art is a method of materially manifesting ideas and ineffable occurrences that exist on the ethereal plane, such as the Akasha. As above, so below. 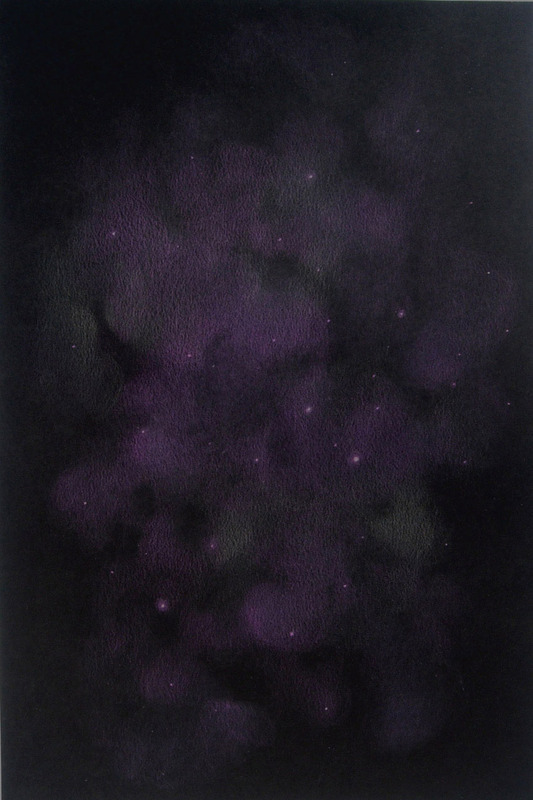 Clusters of light, thought and material aggregate or pass through one another. 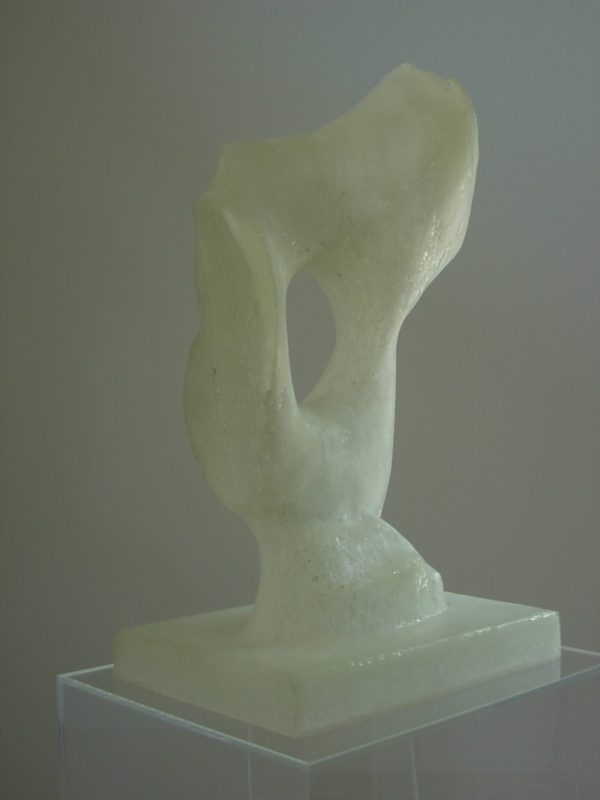 The boundaries separating ideas, senses and bodies are translucent and permeable. A friend of mine in London, Susan Finlay turned me on to the British surrealist artist/occultist Ithell Colquhoun. Susan thought that I would prefer Colquhoun’s later abstract and empyreal images to the surrealist, pictorial work for which she is better known. She’s right. 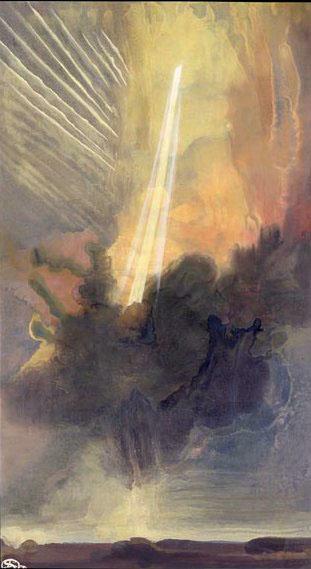 For Colquhoun, art and magic were indistinguishable. Her writing, painting and life were inextricably linked to her spiritual explorations. I’m intrigued by the covers of Colquhoun’s esoteric books. 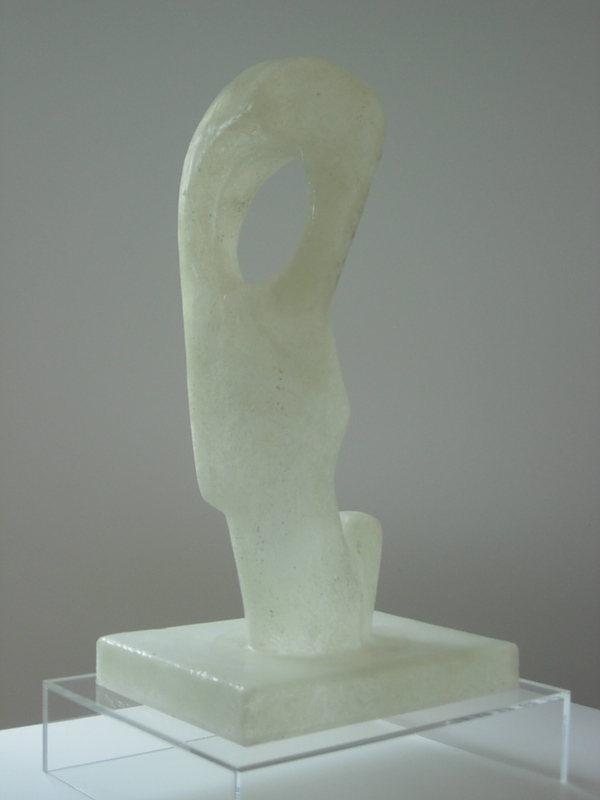 The Living Stones (1957), for example, is a cryptic title with an enigmatic design. I am intrigued by the overt femaleness in its symbolism. 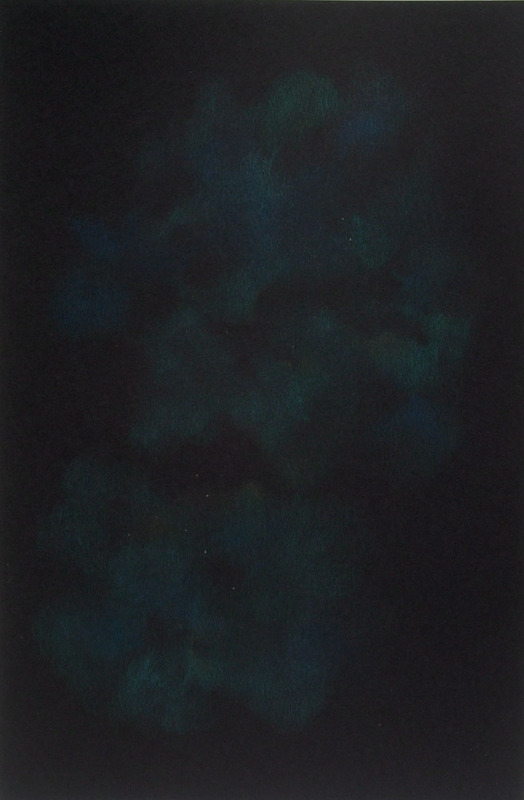 As a pagan, Colquhoun recognized and drew inspiration from the living energy found in all objects that she came across in the natural world. 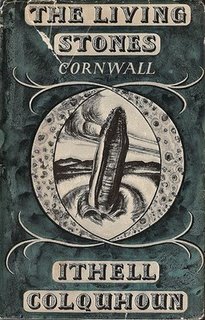 Based for most of her life in Cornwall, Ithell Colquhoun gave to the magical traditions in Britain: the land of ley lines and sacred stone formations. 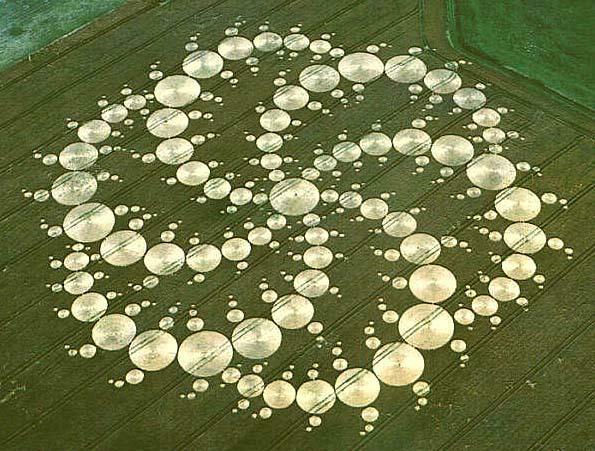 Although crop circles appear throughout the world, they are associated with southern England in particular. Somehow this makes sense to me. As inexplicable phenomena go, there seems to be a particularly British air about them; eccentric, downplayed; witty even. I relate to writer/prophet Daniel Pinchbeck’s take on crop circles. Across the cultural spectrum, very little serious attention is paid to them. This is most likely due to the connotations made with pranksters and hoaxes, which hover directly overhead the crop circles. Of course there are many examples of crop circles, which fail to capture my imagination because of crude execution or because they communicate with written words or obvious pictorial symbols culled from popular culture (clichéd alien portraits and stickmen come to mind). They are made rather than appear. As visual communication, these examples fail to work beyond an obvious, one-dimensional way. There are however many more instances of incredibly complex, elegant, and perfectly executed abstract patterns. They seem to hum in the way that perfect, mathematical resolutions hum. They are ‘true’ in the way that tonic chords are ‘true’ in music. 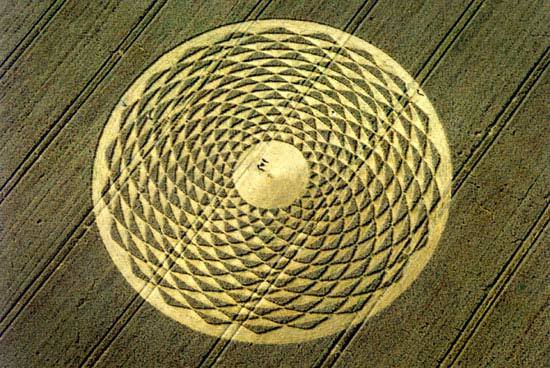 There are some crop circle visitors who claim to actually hear a hum emanating from the earth and the plants. Others claim to see floating beads of light. The patterns are harmonically pure visual configurations. True synaesthesia. In the same way that Pinchbeck reflects, I also can not fathom why crop circles have been overlooked by the contemporary critical art world. Either they represent the artistic expression of non-human, intelligent beings (fascinating) or else they are the (collaborative) work of incredibly skilled and anonymous land artists working in the tradition of Robert Smithson or Richard Long (equally fascinating). Their anonymity and choice of medium allow these artists to completely evade the market driven, commodity based art world. Their impetus to make art seems to come exclusively from a desire to imprint complex, beautiful patterns on the Earth, perhaps to delight an audience, perhaps not. Or perhaps crop circles just simply appear.